This article is about the enigmatic situation in modern physics. An alternative to the special theory of relativity is presented, and it is demonstrated that we do not need the concept dilation of time, and also that the reason to existing confusion is due to misunderstandings of stellar aberration and of the experiments done by Michelson and Morley. It is also demonstrated that bound electrons generate POTENTIAL force that becomes real when a second electron is introduced, which demands energy from the ether. This explains why bound electrons do not loose energy, and explains also why 2 light waves in opposite phase can produce zero light. A book dealing with experimental and theoretical studies devoted to the exploration of the modern ether concept, evidence of its reality and implications for modern physics. This book is one of the best I have ever seen. More than 40 physicists, among them one Nobel laureate, presented their new theories and new experimental evidence. Kotelnikov suggested an electrodynamics which can describe also particles which are faster than light. This suggestion is in agreement with special relativity. We know Hector Munera from his interpretation of the Michelson-Morley experiment which, according to Munera, did show an aether drift. In this book, he presented a new approach to the electromagnetic force. Caroline Thompson presented, for the first time, her phi-wave aether model. Most revolutionary and far-reaching is K?hne's quantum electromagnetodynamics. His theory is a generalization of quantum electrodynamics. It includes Dirac magnetic monopoles and two kinds of photon, the conventional one which he named "electric photon" and a new one which he named "magnetic photon". His theory is the only quantum field theory of the electromagnetic interaction which can explain the quantization of electric charge, which is local, which is manifestly Lorentz invariant, which describes electrism and magnetism symmetrically, which does not require the Dirac string, and which makes testable predictions. K?hne's theory predicts that the magnetic photon couples with electric charges, where the coupling strength depends on the absolute motion of the electric charge. As a consequence, the creation, shielding and absorption of magnetic photons is suppressed by a factor of 700 000 with respect to electric photons of the same energy. As K?hne pointed out, his theory violates the relativity principle. But what is more: K?hne had presented his theory and suggested an experiment to test his theory already in 1997 (http://arxiv.org/abs/hep-ph/9708394). Now, in his contribution to this book he discussed three independent experiments which confirm his magnetic photon rays. Wow, could this mean a Nobel prize within the near future? Description of Spin in the Causal Stochastic Interpretation of Proca-Maxwell Waves: Theory of Einstein?s "Ghost Waves"
This book serves as a useful reminder that the widespread belief that the quantum world is irreducibly weird, indeterministic, unvisualizable, and dependent on human observation, is not required by experimental results, and that a causal, more rational and intuitive interpretation is possible. The book was compiled as a tribute to Jean-Pierre Vigier on the occasion of his 80th birthday. It begins with a preface by Stanley Jeffers outlining Vigier's life. He worked closely with Louis de Broglie and David Bohm, and helped to pioneer the de Broglie-Bohm-Vigier approach to quantum physics, also known as the causal stochastic interpretation. The main features of this approach and how it evolved are explained in an introduction by Lev Chebotarev. 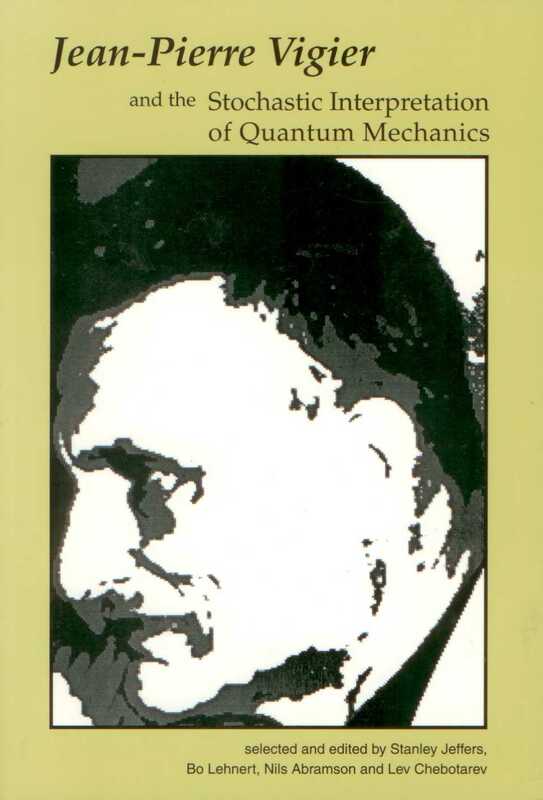 The bulk of the book consists of 22 facsimile reprints of papers on quantum mechanics authored or coauthored by J.P. Vigier. There is also a biography of Vigier's works. Most of the papers are, at least in part, highly technical, but much of the discussion and analysis of the contending interpretations of quantum physics can be readily understood by nonspecialists. As Chebotarev points out, while quantum mechanics works impeccably as a mathematical tool, 'the conceptual situation in quantum mechanics appears to be the most disturbing in modern physics'. Seventy years after the advent of quantum theory, 'there is still no clear idea as to what its mathematics is actually telling us' (p. 1). A central tenet of the standard Copenhagen interpretation of quantum mechanics, as developed by Bohr, Heisenberg, Born, and Pauli, is that 'There is no quantum world, there is only an abstract quantum physical description'. But what does the mathematical formalism actually describe? It is hard to believe that the quantum world underlying our material, macroscopic world consists of nothing but abstract 'probability waves' that somehow 'collapse' into particle-like objectivity whenever a measurement is made (or, according to some theorists, whenever a measurement is registered by a conscious human mind). Each time the position of, say, an electron is measured, it is found in only one place. In between measurements we do not know exactly where the electron is, but the wave function can be used to calculate the probability of it being found in any particular region of space. On the assumption that the wave function provides a complete description of quantum objects, many physicists believe that a particle does not follow a definite trajectory in between measurements, but dissolves into 'superposed probability waves', which then 'collapse' instantaneously, discontinuously, and quite inexplicably when the next measurement is made. Particles are pictured as oscillators (or solitons) beating in phase with their surrounding pilot waves, which in turn result from the superposition of superluminal phase waves carried by a subquantal etheric medium subject to constant stochastic fluctuations. The force, or quantum potential, determining particle motions therefore carries information from the entire environment, accounting for the 'wholeness' of quantum phenomena. The causal stochastic approach can account for all the quantum properties of matter, including all the so-called paradoxes. It therefore disproves the claim that the quantum formalism requires us to abandon not only the quest for an explanation of quantum phenomena but also the concepts of causality, continuity, and the objective reality of individual microobjects. In Vigier's view, the Copenhagen interpretation is based on 'arbitrary philosophical assumptions', and its insistence on the absolute and final character of indeterminacy is dogmatic. In the causal approach, therefore, 'the material world has an existence independent of the knowledge of observers' (p. 170). Vigier does not discuss possible explanations for genuine psychokinesis ('mind over matter'). However, invoking the abstract notion of wave-function collapse certainly contributes nothing to a concrete understanding of such phenomena (see Pratt, 1997). Bohm believed that the causal interpretation opened the door to the creative operation of deeper, subtler, more mindlike levels of reality. Like Bohm, Vigier stresses that it is by no means a return to the classical mechanistic worldview. Some of his statements, however, seem to deny the existence of free will (pp. 50-51, 99-100), though he acknowledges that, given the fundamental complexity of nature, 'The ghost cannot be exorcized from the machine' (p. 169). In several places he refers to the 'negative result' of the Michelson-Morley ether-drift experiment of 1887 (pp.63, 192). However, contrary to what numerous textbooks and popular science books claim, this famous experiment did not give a null result. Vigier (1997a) himself acknowledges this in an article not included in the book, or even mentioned in the bibliography. In it he states: 'the observed effect was not zero in Michelson's famous experiment, as later confirmed by a (presently almost forgotten) set of very detailed and very careful experiments by Morley and Miller [Miller, 1933].' 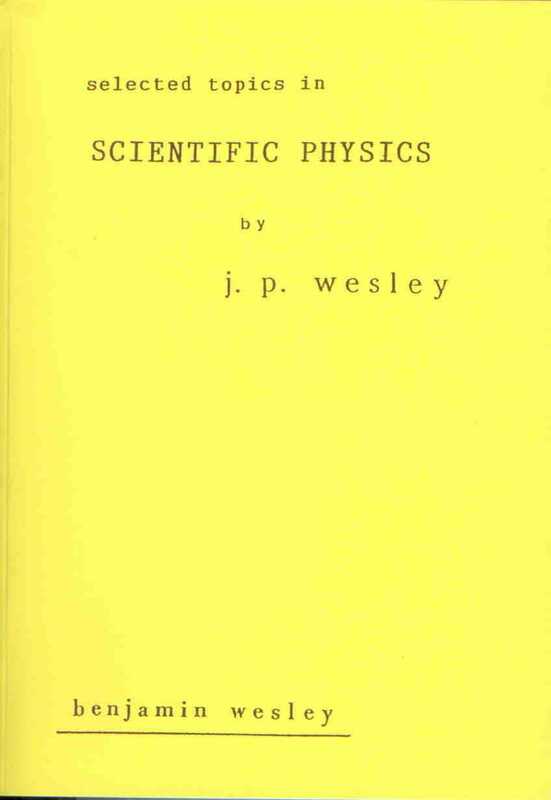 He presents a brief overview of the 'long set of remarkable experiments' conducted from 1881 to 1926, which 'are now completely ignored in the physics community'. These experiments detected a small but consistent and systematic ether drift of about 9 km/s. Although relativity theory assumed a zero ether drift (and a constant velocity of light), Vigier (1997b) argues that a positive ether drift is compatible with special relativity if photons are assumed to have a very small mass. He also argues that Sagnac's discovery in 1910 of fringe shifts in rotating interferometers (the Sagnac effect) can be reconciled with general relativity on the same assumption. Whether the results of ether-drift experiments, including more recent ones (e.g. Silvertooth & Whitney, 1992), are best understood in terms of standard relativity theory is hotly contested (e.g. Galeczki, 1995; Hazelett & Turner, 1979; M?nera, 1997; Spolter, 1993). If confirmed by experiment, it would necessitate a complete revision of present cosmological views. The associated tired-light models could possibly replace the so-called expanding Universe models. Non-velocity redshifts could explain the anomalous quasar-galaxy associations, etc., and the Universe would possibly be infinite in time (p. 273). 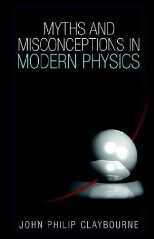 Vigier's book is an important contribution to the debate on fundamental aspects of quantum physics. 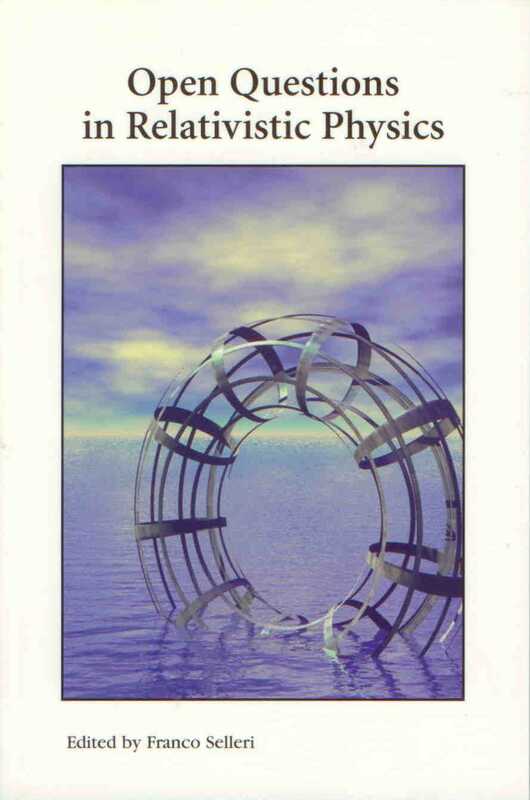 This book is the first to describe a very successful objective unified field theory which emerged in 2003 and which is already mainstream physics - Einstein Cartan Evans (ECE) field theory. The latter completes the well known work of Einstein and Cartan, who from 1925 to 1955 sought to unify field theory in physics with the principles of general relativity. These principles are based on the need for objectivity in natural philosophy, were first suggested by Francis Bacon in the sixteenth century and developed into general relativity in about 1915. In this year, using Riemann geometry, Einstein and Hilbert independently arrived at an objective field equation for gravitation.Since then there have been many attempts to unify the 1915 gravitational theory with the other three fundamental fields: electromagnetism, the weak and strong fields. As described for the first time in this book, unification is achieved straightforwardly with the principles of standard Cartan geometry and the Evans Ansatz. The latter shows that electromagnetism is spinning spacetime, gravitation is curving spacetime and that they are unified with the structure (or master) equations of Cartan. 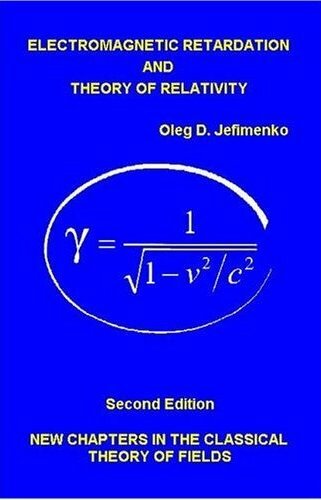 Quantum mechanics is unified with general relativity using the Evans Lemma and wave equation.Technical appendices and charts are provided which show how all the major equations of physics are obtained from the ECE field theory and two introductory chapters describe the background mathematics from an elementary level. In this third volume, ECE theory is extended to the Sagnac effect and Faraday disc generator to show that electrodynamics is spinning space-time in general relativity. These two effects are difficult to explain with special relativity. A simplified dielectric ECE theory is developed and applied for example to cosmology.One chapter is dedicated to a convenient summary of all the details of Cartan geometry needed to develop ECE theory. The important topic of spin connection resonance (SCR) is introduced and applied to new energy and counter-gravitation. Finally wave mechanics is developed in ECE theory. In 1905, Albert Einstein published his Theory of Special Relativity within which he described the now famous mass-energy formula E=mc2. This theoretical construction revolutionized the classical perspective of the universe as understood since the time of Isaac Newton. No longer were the classical concepts of Absolute Space and Absolute Time valid irrespective of observation point. Now the concepts of Length Contraction and Time Dilation were in vogue and Physics would never be the same. Until now! In an easy to read format along with many illustrations, Michael Strauss leads the reader in a comprehensive description of the history leading up to Special Relativity Theory. He points out errors in the original assumptions, documents and ideas which led to the acceptance of this theory. However, his most powerful argument against Special Relativity is none other than the equations of Special Relativity! As a result, E=mc2 is no longer relative! 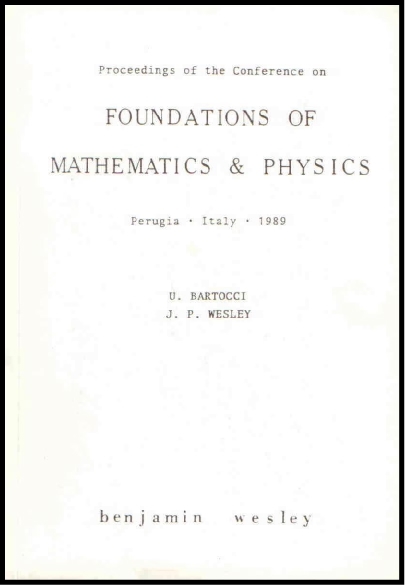 This book presents 26 papers concerning important fundamental questions in mathematics and physics. Is a line a continuum or a dense set of points? Is space empty or does it contain an ether? Is the ether a sea of virtual particles or a gravitational field? Does quantum theory say nature is actually unpredictable? Can alternative logics resolve paradoxes in physics? Are the space-time ideas of relativity tenable? 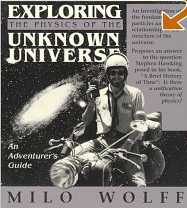 Can absolute velocities be measured? Can conservation of energy be violated? Why are gravitational and inertial masses equal? Does mass really change with velocity? The authors do not agree with each other. Some accept relativity, while others say it is wrong. The observed force between suspended antennas and the results of many other experiments contradict Maxwell theory and special relativity and are predicted by classical Weber electrodynamics. Some claim quantum behavior is intrinsically unpredictable; while others claim microphysical reality and suggest crucial experiments to prove their point. There is a claim to having observed cold nuclear fusion in a spark discharge. There is a claim to having violated the conservation of momentum and energy experimentally. The Weber potential (so successful in electrodynamics) when applied to gravitation predicts the mass-times-acceleration force as an induction force due to the far mass in the universe, verifying Mach?s principle and proving the identity of gravitational and inertial mass. A unipolar device is described that is supposed to extract energy from space. The Weber potential also predicts the result of the Kaufmann-Bucherer experiments; so mass may not, in fact, vary with velocity. This book presents some new important concrete results. It may not provide the reader with the particular answers he seeks; but many of the important fundamental questions are presented; and it provides a gold mine of references to facilitate the search for further answers. 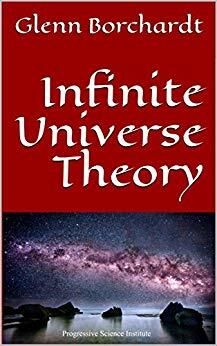 Part II discusses cosmology, space and the universe. It explores their enigmas and paradoxes. Dr Wolff's role is a friendly guide to the reader, enabling her/him to understand the machinery behind Nature's laws, and to help solve the puzzles which have confounded scientists over the years. The century-old controversy of wave structure or substance structure of particles is examined and it is shown that a wave structure is the origin of the natural laws. The mysterious role of space itself is explored and the reader is asked and helped to choose between truth and prejudice. "A major fallacy unique in scientific history." Have you ever read the book Has Hawking Erred written by Gerhard Kraus in 1993 with that daring statement about Einstein's time dilation? "The fact that nearly all academic physicists support Special Relativity proves nothing about its validity," said by John Chappell Jr., chairman of NPA, in 1996. Did you know that 90 years after Einstein's Relativity publication, physicists still fail to stop their own colleagues' criticism against the theory? "All motions may be accelerated and retarded, but the flowing of absolute time is liable to no change," said Isaac Newton. Did you know that all so-called evidence thought to confirm Einstein's time dilation, in fact only confirm Newton's law that motion can be changed, but time is still absolute? Have you ever wondered what time is? Why can our space be curved? Did you ever feel sick of hearing physicists admit how confused they are about time, yet they can be so sure of time dilation? Did you ever feel convinced listening to physicists describe what 4-dimensional space-time is like, while saying you cannot draw it? Did you ever feel stupid for not understanding Einstein and Relativity but still happily accepting it? Did you ever dare think Einstein is wrong, but not dare say it due to your limited Math and Physics? Whatever your favourite excuse, do you ever believe one day you CAN understand Einstein and realize he is wrong? 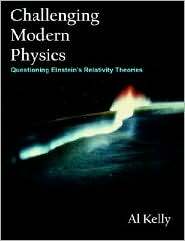 If you never bother asking those questions, don't read this book for this book is nothing but a challenge to Einstein's Relativity! 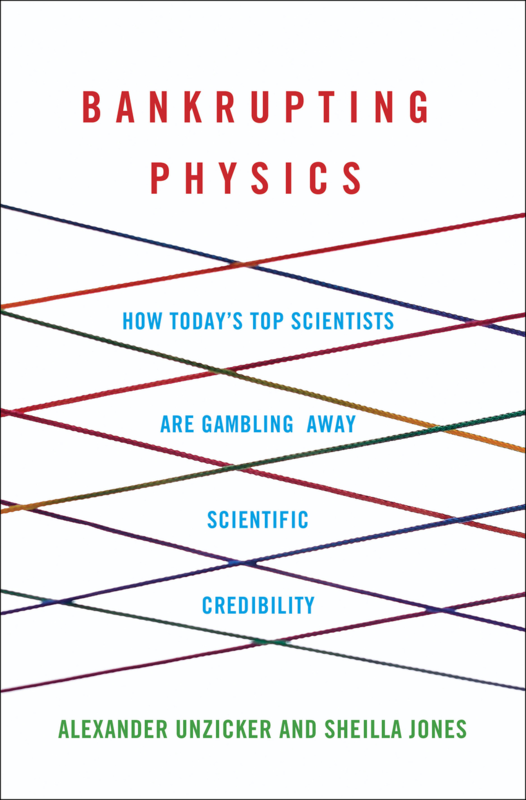 "This book, in 10 Chapters and 191 pages, describes the "tour de force" of a common sensed person, with average scientific education but not a physicist himself, in search for an understanding of Einstein's Relativity theory. He is convinced that at least three important points of the theory are total flaws: 1-time dilation; 2-space curvature; and 3-the absolute constancy of light speed, regardless of source velocity or observer velocity. The first two chapters set the dialectical stage, quote some dissidents of RT (Relativity Theory) including my own group (Natural Philosophy Alliance) and Gerhard Kraus, and anticipates some of the author's theses, but without much reasoning. In fact these two initial chapters appear to me somehow vague and slow. It is in Chap. 3 (an imaginary interview with Einstein) where we start reading some solid arguments, mostly describing the disconcerting variety of opinions that 20 relativistic authors explored by John Doan hold respect Time Dilation. On page 35 John Doan presents the critique. It is not original but is forcefully expressed and repeated along the entire book as a leitmotiv, namely, that asymmetric time aging as usually claimed by a group of relativists when one clock moves back and forth, showing "less" time than an identical clock that remained at "rest" at the origin, is a logical impossibility . Since relative motion is perfectly reciprocal, symmetric and interchangeable, there is no way to say which clock must really go slower. They can both get slower, leading to a>b and a<b simultaneously. "The arguments against space-curvature and light speed constancy are less forcefully presented. John Doan even dares to give his own version of 4-D space which I personally cannot approve (it is still 3-D). Concerning light speed he describes the relativistic position as claiming that c+v = c, or that c+c = c. These, of course, are inaccurate expressions which relativists do not endorse. But the reader gets the hint that in practice this is what RT concludes using its velocity composition expression, (which the author does not quote). After an imaginary interview with Einstein and asking him twenty questions that he cannot answer the author is ready to "divorce" Relativity and return to Newtonian absolute space and time. "In an equally imaginary interview with Newton Time Dilation is replaced by "motion change". John Doan does not question the possibility of Time Dilation provided it is due to an asymmetric physical cause, not to Einstein's uniform motion only, and provided we refer it to a physical change in a clock, not in "Time", whatever Time means. Newton's affirmations sound a bit authoritarian but his absolute space, time and simultaneity win the day in the author's view. 'Requiem' ist ein treffender Titel f?r dieses Buch ?ber eine Kulttheorie, die seit ihren Anf?ngen von Widerspr?chen geplagt ist. Die Autoren, beide Physiker, zeigen streng wissenschaftlich und doch unterhaltend, da? 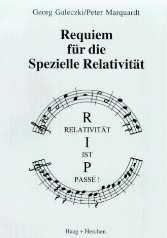 die Krise der heutigen Physik durch die "spezielle" Relativit?t mitverschuldet wird. Sie weisen aber auch auf Wege aus dieser Sackgasse: F?r die aus dem relativistischen Prokrustes-Bett befreite Physik stehen empirisch korrekte und widerspruchsfreie L?sungen zur Verf?gung. Dynamik, Elektrodynamik, Quantenmechanik und Thermodynamik fordern ein globales ausgew?hltes Bezugssystem, damit Energie- und Impulserhaltung, Strahlung, Sternaberration, Unipolarinduktion, Temperatur usw. konsistent beschrieben werden k?nnen. Galilei hat Recht: Die Erde bewegt sich - sie bewegt sich im absoluten Sinne! Das Buch ist eine aufmunternde Rechtfertigung f?r alle, die nicht einer absurden Lehrmeinung, sondern ihrem gesunden Verstand vertrauen. 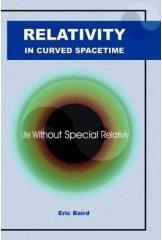 This book gives a good overview of arguments against the Special Relativity Theory. Despite a few loose ends and some fuzzy reasoning the authors do a good job convincing the reader that all is not well in SRT land. Reference is made to theoretical and experimental proofs (with a good reference list) against Einstein's interpretation of the relativity theory. But even Lorentz' version of the relativity theory is put in doubt, and some old ("forgotten") and new electrodynamics theories are discussed. A good addition to standard text books, to compensate for their SRT cult! I felt very confirmed in my own evaluation of special and general relativity. My approach was to use logic and linguistic analysis to arrive at the same conclusions that are derived in the book using experiments, historical and mathematical analyis. The authors are invited to to read my critique and to compare our two approaches. I would like to discuss this with them further. From Annalen Der Physik I received the response - we will not publish or even consider any critique of relativity as the subject is closed for us! 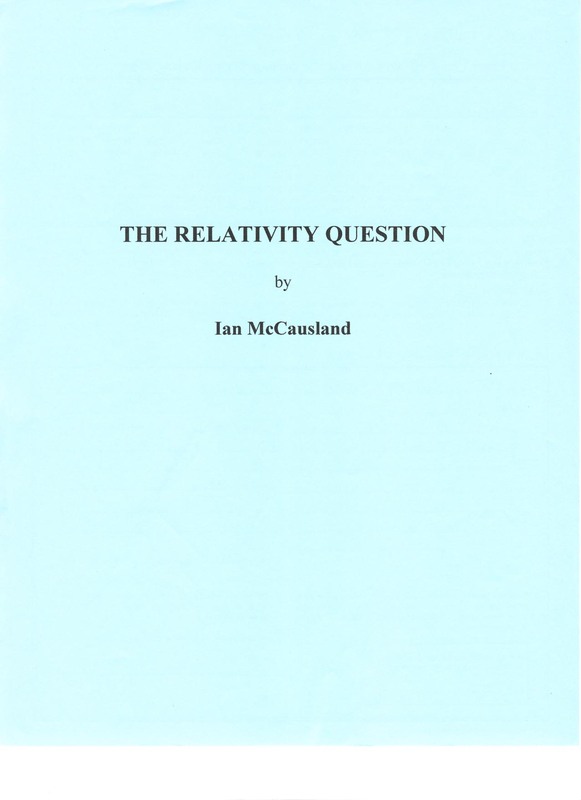 In addition to the correspondence, Dr. McCausland also presents criticisms of the theory of relativity itself. 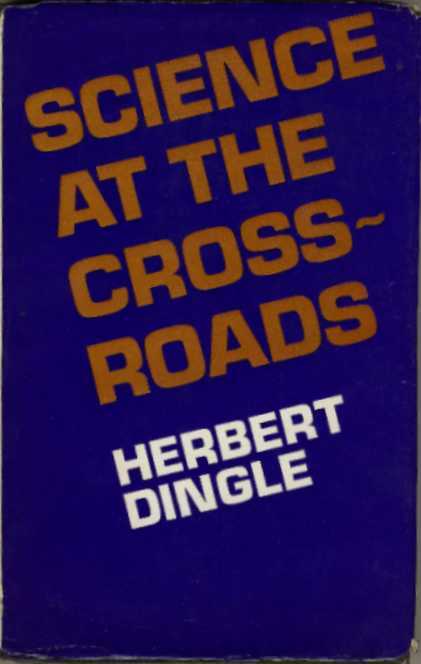 He details logical flaws in the arguments of Dingle's adversaries that can be understood by scientists and non-scientists alike. From their own words we can witness their case falter and ultimately fail. Arguably more than any other book, Einstein Plus Two helped launch the dissident revolution of the 1990s. 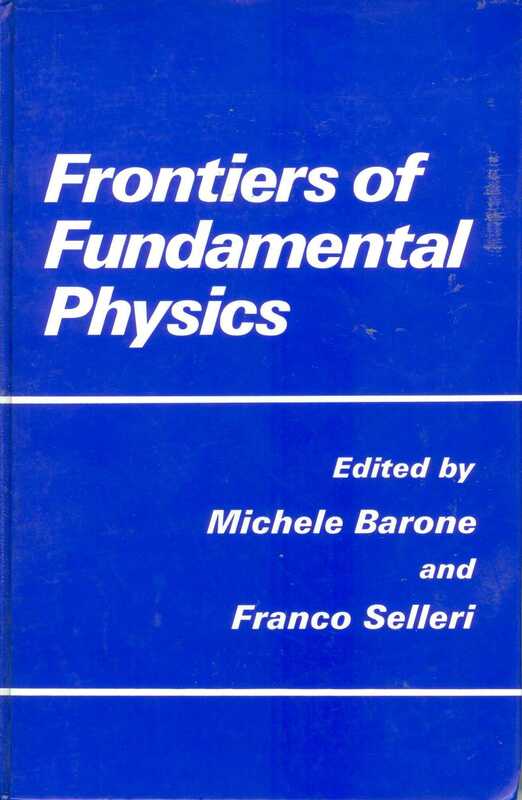 As a consequence of this book, Beckmann founded Galilean Electrodynamics in 1990, a time when several other dissident journals made their start. Beckmann's concept of the relativity principle without Einsteinian observer dependence serves as the major unifying theme. It stresses the idea of motion with respect to the local field rather than to the observer of special relativity theory. 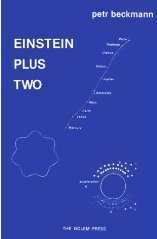 The book is divided into three sections: Einstein Plus Zero, One and Two. In Einstein Plus Zero, Beckmann reexamines the historic experiments of Bradley, Fresnel, Fizeau, Airy, and of course, Michelson with Morley and Gale, and shows how understanding motion with respect to the local field makes sense of them all. In Einstein Plus Zero, he considers quantization of electron orbits, electromagnetic mass, the meaning of Planck's constant and the Schr?dinger Equation from a proper understanding of central motion. Finally in Einstein Plus Two, the large questions of gravitation, Mercury's perihelion, the Titius-Bode Series and inertia are addressed. Alternative ways of considering fundamental matters should of course be vitally important for the progress of science, unless one wanted to admit that physics at the end of the XXth century has already obtained the final truth, a very unlikely possibility even if one accepted the doubtful idea of the existence of a "final" truth. The merits of the Olympia conference should therefore not be judged a priori in a positive or in a negative way depending on one's refusal or acceptance, respectively, of basic principles of contemporary sience, but considered after reading the actual new proposals and evidence there presented. They seem very important to us... - From the Preface. Professor Dingle's reputation in the world of science, in Britain and further afield, is considerable, as have been his achievements. It is therefore a matter of fundamental importance that after much of a lifetime subscribing to what is regarded as a central part of modern physics "Einstein's Special Theory of Relativity" a scientist of Professor Dingle's wisdom and experience should now cast grave doubt on it, and ask for basic reconsideration. He writes: "The habit has developed of assuming that a physical theory is necessarily sound if its mathematics is impeccable: the question of whether there is anything in nature corresponding to that impeccable mathematics is not regarded as a question; it is taken for granted." Professor Dingle's views have become widely known through a series of extraordinary, sometimes bitter, correspondences in Nature and the Listener. In the latter, much of the argument centred on the matter of the now famous 'travelling clocks'. His technical argument is reserved for the second part of this book. The first part will cause shock and dismay to many, whether scientists or not. 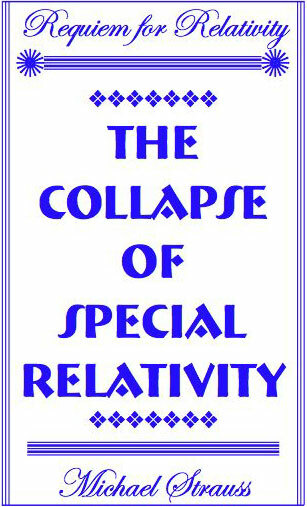 In his attempts over recent years to raise the basic question of Special Relativity's rightness or otherwise, the author has found himself obstructed and progressively disregarded by key figures in the world of scientific responsibility and information. He gives chapter and verse to this, and the whole story is damning to a discipline that has claimed so much. Professor Dingle issues a grave warning against the perils that exist to us all as a result of this indifference and lessening of scientific honesty.